To achieve the best look when wearing a dress, one needs to know the exact body type. A person should know the parts of the body that needs to be emphasized and the parts that needed to be streamlined. This is equally relevant in deciding which particular pieces of clothing to be purchased. Dresses are a dime a dozen on as many websites found on the internet nowadays. But, try to exercise a little caution in choosing a reliable website. It should offer free shipping and accepts returns whenever shoppers can find that the items they purchased were unsatisfactory. 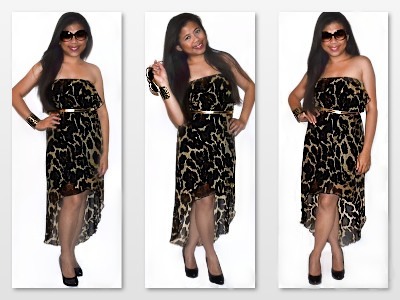 But, who wouldn't be satisfied with this Ruffled Leopard print Hi-Lo Strapless dress? Animal prints are so very in these days. It will be a head-turner for anyone wearing this ensemble. Looks daring yet sophisticated. Another dress that one should be wearing these days are those that have vibrant colors. Colors that look uniquely combined, yet when they're sewn together like this belted cold-shoulder colorblock dress, the dress becomes a bomb! Most of the times, accessorizing is key to successful dressing. If you are interested in following Lavishville.com trendy and hip dress designs, like their page on Facebook, and check out their Twitter account for regular updates, too. I like your dresses mommy, it looks good on you. you rocked sis!!! You look like a pro with your clothes... Kailan kaya ako pwedeng mag model? those are beautiful dresses sis! it suits u best. it shows your figure. thanks for sharing lavishville.